The two women, of a similar age, greeted each other warmly, shaking hands and smiling. One was the most powerful woman in the world - the other had been born into slavery. It had taken more than 50 years for Martha Ann Erskine Ricks of Liberia to finally fulfil her life-long dream. And her encounter with Great Britain's Queen Victoria was extraordinary in many ways. Extraordinary because it made such an impression on the queen that she wrote about it in her daily journal; because it was so warm; and because it happened at all. The queen and the farmer met in Windsor Castle on Saturday, 16 July 1892. Martha Ricks took with her a present of a satin quilt, embroidered with a coffee tree in full bloom, complete with red and green berries. "At home, when a poor man comes to visit us on our farm, he never comes without some little present," Martha Ricks explained to the London-based newspaper, the Pall Mall Gazette, a few days after the meeting. "How could I come to Queen Victoria, and bring her no present? "I made it all myself, every stitch of it." Surrounded by courtiers, her children and grandchildren, Queen Victoria told Martha that she "felt greatly honoured by the trouble you have taken to come to see me," according to a report in the Daily Graphic, a leading illustrated newspaper of the time, which also carried a sketch of the meeting on its front page. In her diary the Queen described Martha as "very loyal… with a kind face. I shook hands with her and she kept holding and shaking mine". "She did not stay long in the golden room and I forgot what she said, but I shall never forget how she smiled and how she shook hands with me." Martha had travelled a long distance to meet Queen Victoria - physically and metaphorically. 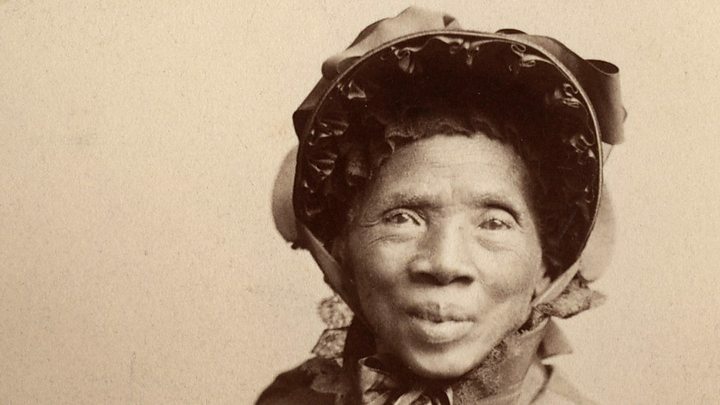 She had been born into slavery in 1817 in Tennessee, in the southern United States. Her father George Erskine bought the family's freedom and, in 1830, when Martha was 13, the family of nine moved to Liberia, a West African country founded by former American and Caribbean slaves. Tragically, within a year, all but Martha and two brothers had died from fever. Martha settled on a farm in Clay Ashland, which is today a quiet village located on the lush green banks of the St Paul River, about 10 or so miles (16km) east of the capital Monrovia. Clay Ashland was one of the first places settled by former slaves from the US who, with the help of the American Colonisation Society, had made West Africa their home from 1820 onwards. Martha became a farmer, growing her own vegetables and crops like ginger, cocoa, and coffee. She also gained quite a reputation as a gifted needlewoman, winning prizes at national fairs for her silk stockings. And she was skilled in the art of quilting - a tradition brought over from the south of America by the settlers. "Aunt Martha really did inspire the women of Liberia to do quilting," Evangeline Morris Dennis says of her ancestor. Martha Ricks was the great-aunt of Mrs Dennis' mother. "When the idea came to Aunt Martha to make this present, the first thing that came to her was to give her a quilt of a coffee tree." The reason why, says Mrs Dennis who is 83, is that coffee trees flourished on Martha's farm - and were, she says, a symbol of the potential of Liberia, which in 1847 had declared itself Africa's first republic. Mrs Dennis talks as if she had met Aunt Martha, although she did not. Martha died in 1901, by coincidence the same year as Queen Victoria. But Martha's stories have been handed down the generations and the stories of that event 125 years ago - and the quilt - are often spoken about. Martha Ricks's Coffee Tree quilt remains special to the family. And also to the history of Liberia, argues Kyra Hicks, a quilter, quilt historian and the author of the children's book Martha Ann's Quilt for Queen Victoria. "Here was a former slave who had spent 50 years wanting to give this gift," she says. "The sheer audacity of the faith she had to do that - and her faith that she would, one day, see the Queen of England - that was just marvellous." Ms Hicks says Martha's quilt was the first Liberian quilt to be given as a diplomatic gift. The tradition was revived in 2005 when Ellen Johnson Sirleaf became Africa's first elected female president. She often gives quilts as presents to visiting dignitaries. So why did Martha Ricks feel so compelled to make a quilt for Queen Victoria? One reason is that the UK was the first country to recognise Liberia's independence - even before the US. And, in July 1892 when speaking to the Pall Mall Gazette, Martha herself tells us that it was because of Queen Victoria's support for the anti-slavery movement. "I had heard it often, from the time I was a child, how good the Queen had been to my people - to slaves - and how she wanted us to be free." Sadly, the quilt is now missing. But the family and Ms Hicks, who has spent more than seven years looking for it, hope that someday, someone could open a cupboard and find it.